Every night (including weekends) 19:00-20:00. 14 Proper Nouns, a set of references, drawn from Hassan Khan's seminal work 17 and in AUC, will serve as subject matter for a fortnight of discussion between the artist and curator-in-residence Nida Ghouse. 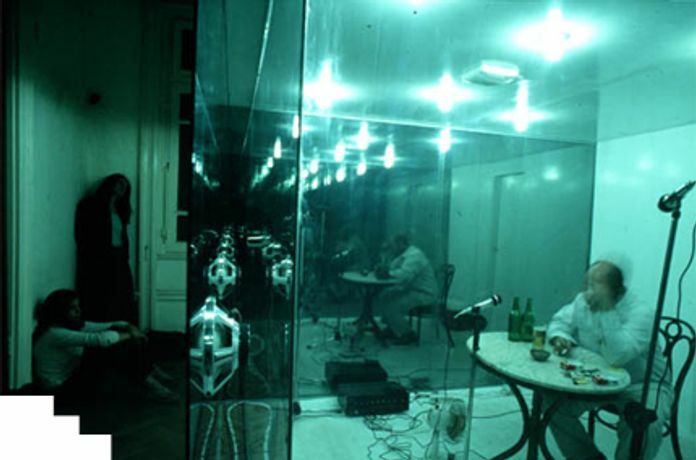 The discussions will be rooted in 17 and in AUC  the transcriptions, which is a document of every audible word uttered by the artist during a 56-hour performative action that took place in a rented apartment in downtown Cairo. Over 14 consecutive nights in 2003, from 7 until 11 pm, the artist sat in a sound proofed one-way mirrored glass room, drinking beer and smoking cigarettes, literally reflecting onto himself. In front of an audience he could neither see nor hear, his primary purpose was to speak of the years he spent from 1990 to 1995 as a teenager at the American University in Cairo (AUC). The programme for the à»proper nounsà¼ is as follows: Friday 21 October: Funhouse a year in the house of bliss and loss Saturday 22 October: Yassin El Tohamy the munshid who made philosophical poetry as popular as coca-cola Sunday 23 October: Egyptian TV strategies learnt from the world's worst television Monday 24 October: Pulmolar a cough syrup that bent streets and made asphalt soft uesday 25 October: John Cage the tapes that came after reading silence Wednesday 26 October: Attar daily breakdowns at the theater workshop Thursday 27 October: Midan Ramsis paranoia and ecstasy with the crowd Friday 28 October: Hendrix a guitar becomes something else Saturday 29 October: JC Auditorium auteur cinema and the incredible power of the living moving face Sunday 30 October: William Blake how hell was made dense Monday 31 October: Ard El Golf making noise in bedrooms and on rooftops Tuesday 1 November: Sherif a friendship forged through a shifting lens Wednesday 2 November: Cairo Atelier the haunt of the corrupt intellectual Thursday 3 November: English Literature a university department with a seminar room Hassan Khan (b.1975) is an artist, musician and writer. He lives and works in Cairo, Egypt. Nida Ghouse (b. 1982) is a writer and curator based in Bombay, India, and the first recipient of the DELFINA-FICA Research Fellowship residency in partnership with Iniva and Goldsmiths. Please note that each event is limited to an intimate audience of 15 people, strictly by RSVP. To reserve a seat, please email rsvp@delfinafoundation.com.